The Wisconsin Department of Transportation (WisDOT) is working to improve pavement durability and cracking resistance by increasing the amount of binder in their asphalt mixtures. In the last few years, they implemented an approach referred to as “regressed air voids” for the design of all asphalt mixes. The concept of regressed air voids is to design a mix for the current practice of 4.0% air voids and satisfy all other Superpave criteria, then determine how much additional virgin asphalt binder is needed to achieve an air void target of 3.5% or 3.0%. NCAT recently completed a study for the Wisconsin Highway Research Program to evaluate the impact of regressed air voids on cracking, rutting, and moisture damage resistance of asphalt mixtures. The objective of the research was to assess the impacts of increasing asphalt binder contents of mixtures designed using the regressed air voids concept and to recommend whether or not to proceed with implementation of this approach. The study evaluated mixtures from each of WisDOT’s three traffic categories. The research panel advised NCAT researchers on selection of the initial mix designs and mixture performance tests for the laboratory experiment. Testing included six primary mixes designed for low, medium, and high traffic levels and containing various amounts of reclaimed asphalt pavement (RAP) and recycled asphalt shingles (RAS). After verifying the primary mix designs at 4.0% air voids, variations of each mix were tested at asphalt contents corresponding to 4.0, 3.5, and 3.0% air voids. Mixture performance tests included the Illinois Flexibility Index Test (I-FIT) per AASHTO TP 124 to evaluate intermediate temperature cracking resistance, the Disk-Shaped Compact Tension (DCT) Test per ASTM D 7313 to evaluate low temperature cracking resistance, and the Hamburg Wheel Tracking Test (HWTT) per AASHTO T 324 to evaluate rutting and moisture damage resistance. For five of the six mixtures evaluated, regressing the design air voids to 3.0% air voids increased the asphalt contents by 0.3 to 0.4% and resulted in a clear improvement in the flexibility index. Based on these results, the regressed air voids approach to mix design has a positive impact on the intermediate temperature cracking resistance of asphalt mixtures. Although DCT Fracture Energy results also increased for mixtures regressed to 3.0% air voids, the improvement was not statistically significant. Based on these results, the regressed air voids approach is not expected to have a significant impact on thermal cracking. Hamburg results analyzed using the AASHTO procedure indicated that two of the mixes were susceptible to moisture damage. However, field performance of these mixtures has not shown any indications of stripping. This could indicate that the Hamburg test can give false positive errors. None of the six mixtures exhibited stripping inflection points in the first 10,000 passes of the test. The four mixes that had no signs of stripping completed the full 20,000 passes with rut depths less than 12.5 mm. Corrected rut depths using a modified method of analysis were significantly lower than the common maximum rutting criterion of 12.5 mm. 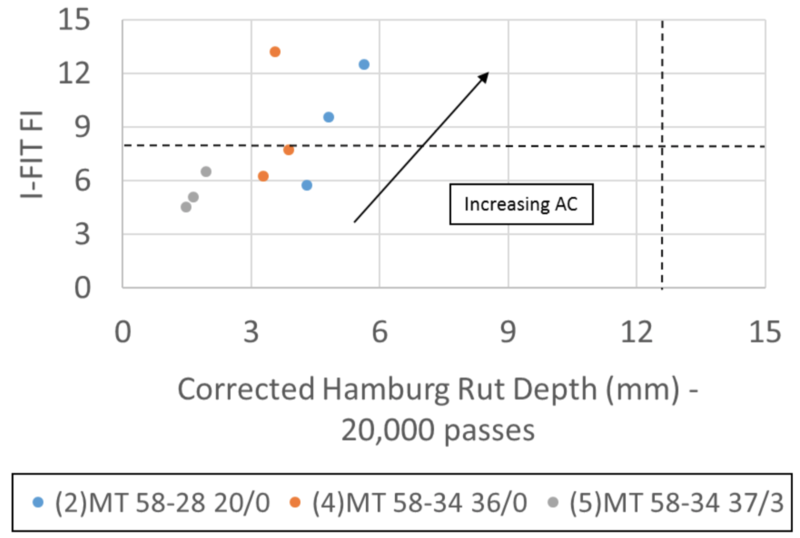 All of the mixtures designed to 3.0% regressed air voids met the rutting criterion, indicating that the regressed air voids approach would not likely cause a problem with increased rutting susceptibility of asphalt pavements. Many asphalt technologists understand that only adjusting the air void target may not be sufficient to optimize mix designs and ensure that they will perform as desired. Consequently, the concept of balanced mix design is gaining popularity as a way to better assess a mix design’s resistance to major forms of distress, including rutting, cracking, and moisture damage. In a balanced mix design framework, a performance diagram can be a useful tool to examine the balance between the rutting and cracking susceptibility of an asphalt mixture. Using such a diagram, a cracking parameter is plotted against a rutting parameter to assess the interaction between the two as the asphalt content of the mix (or other mix variable) is changed. 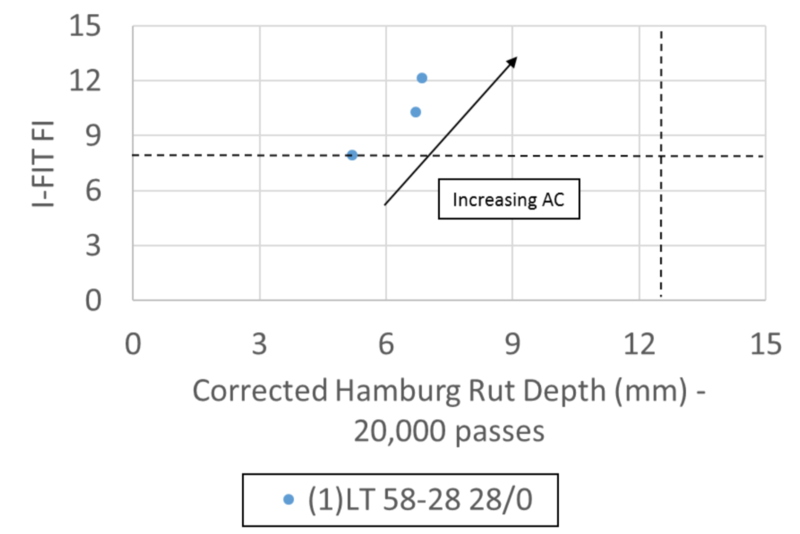 In this case, the I-FIT flexibility index (FI) was plotted against the corrected rut depths from the Hamburg test. Figures 1 through 3 show performance diagrams for the low, medium, and high traffic Wisconsin mixes, respectively. 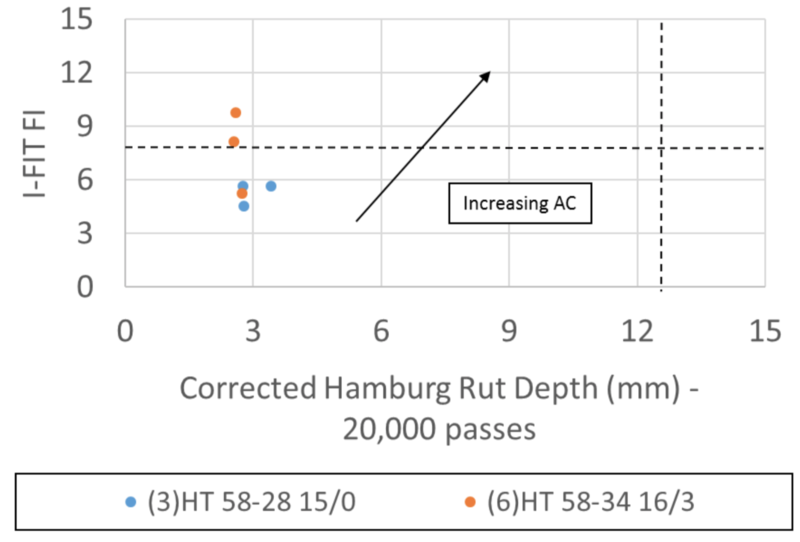 For the majority of the mixtures, there is a significant increase in flexibility index (vertical axis) due to higher asphalt contents resulting from the regressed air voids approach, but the change in rutting resistance (horizontal axis) was not much, and all mixes easily met a common criteria of 12.5 mm in the Hamburg test. Comparing the performance diagrams reveals that the high traffic category mixes (designed to higher Ndesign levels) shift toward the lower left part of the diagrams. It makes sense that the higher gyration mixes are more rut resistant and that they are generally going to give up some cracking resistance. The important questions are: how much cracking resistance should be sacrificed and how much rutting resistance is enough? Results from this project indicate that the regressed air voids concept can improve cracking resistance without compromising the deformation resistance of asphalt mixes. Therefore, a three-stage implementation strategy was recommended: (1) full implementation of the 3.0% regressed air voids mix designs without performance tests, (2) continued use of the 3.0% regressed air voids mix designs with added Hamburg rutting and stripping criteria based on traffic levels, and (3) implementation of balanced mix design and eventually withdrawing the regressed air voids design requirement and other volumetric criteria for mix design approval.